Launched in 2017, the Smirnoff Equalising Music initiative began a three-year global project to escalate the gender parity in the music industry by 2020. 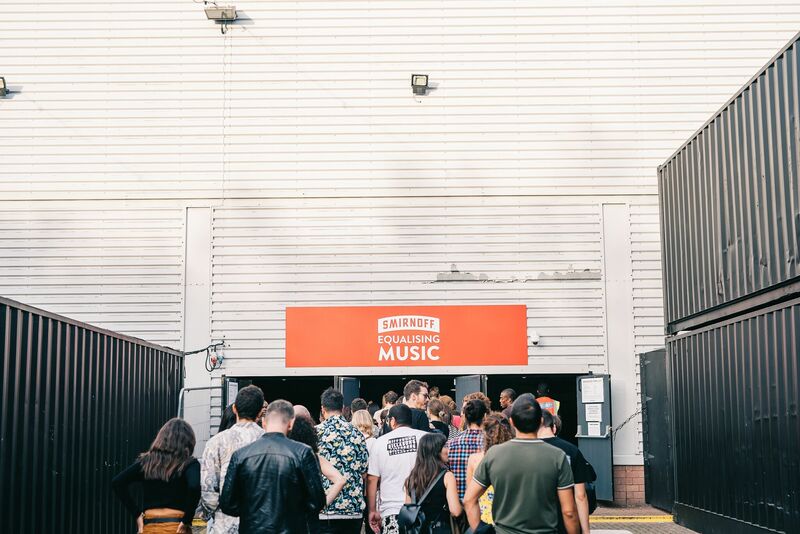 Smirnoff Equalising Music is an initiative designed to effect real, top-down, industry-wide change – the disparity becomes clear when we look at statistics from research like FACTS, a bi-annual study of festival lineups by Female:Pressure, which showed that in 2017 women still only accounted for 19% of festival headliners. With this in mind, Smirnoff decided it was time for a change – and also for a massive party. Amidst the London doom and gloom (although if we're being honest, it's pretty universal at the moment), the unavoidable awkward pub chat of Brexit, general sadness in the capital and London's nightlife taking a nosedive – including three months of radio silence from our Night Czar – Printworks is a shining light through the darkness. This weekend, at the Smirnoff Equalising Music event, the venue shone brighter than ever before. With the general atmosphere one of positivity, equality and good vibes from the get go, the music provided from expert selectors only enhanced the spirit behind Smirnoff's industry initiative. As well as the headline acts Printworks and Smirnoff welcomed young female DJs, who had been mentored by the main stage players, to takeover the Dark Room. A standout opening set came courtesy of Jaguar, mentored by The Black Madonna, who provided 90 minutes of uplifting, disco-drenched, housey grooves – she's uploaded it to Soundcloud and we STRONGLY recommend a listen back. Over in the Press Halls, Grainger, HAAi and Mella Dee set an unbelievable precedent for the acts to follow. The words "warm up sets" didn't apply at this event – the party began at 100mph and finished exactly the same way. Taking over, Honey Dijon filled the Press Halls with the sounds of Donna Summer's "I Feel Love" before handing over to Artwork with an iconic groove on the decks to Cheryl Lynn's 1978 classic, "To Be Real". Due to late trains (these things do happen, even to DJs) The Black Madonna stepped in following Artwork, after Peggy Gou found herself victim of the UK rail network. What followed was stellar sets from both The Black Madonna and Peggy Gou, with the former providing not one but two sets and Peggy still delivering a high-octane performance in the middle of these – despite her troubles. Sometimes you go to an event and you know it's one you'll remember. I've not seen or felt a room like that in a very long time. With the overwhelming sense of love emitting from both the diverse crowd and the DJs paired with the rising stars who's performances glittered with the support and guidance they'd received from their mentors – the event completely captured the essence of exactly what the Equalising Music initiative stands for. Event Review · Events Stage · Main Stage · Music Industry · U.K.